In a previous column, entitled THE ATTACK ON MARY, we noted that of all the things that drive anti-Catholics nuts about Catholic beliefs, the thing that drives them most nuts is what we believe about Mary. And of those things which we believe about Mary, such as the Immaculate Conception and her bodily Assumption, the most irksome, to non and anti-Catholics, is our belief in her Perpetual Virginity. In fact, the very words “Perpetual Virginity” seem to provoke a cringe similar to that provoked by the sound of fingernails scraping a chalkboard. The intent in this column is to share a few thoughts on how to engage the “Protestant” disbelief in the Perpetual Virginity, but we should first note that a disbelief in the value of consecrated virginity in general is, at its root, a fundamental Protestant tenet promulgated by “the First Protestant”, Martin Luther. While Luther may have had some legitimate beefs relative to the so-called “sale of indulgences”, it seems that his real itch involved celibacy. In 1521, Luther wrote: I see myself insensible, hardened, sunk in idleness, alas! seldom in prayer, and not venting one groan over God’s Church. My unsubdued flesh burns me with devouring fire. In short, I … am devoured by the flesh, by luxury, indolence, idleness, somnolence. Apparently Luther had his own body in mind for he eventually helped himself to the nuns, taking one for his wife and offering another to the Bishop of Mainz (if he would convert) during a Luther-inspired pogrom against celibacy in which scores of German monks and nuns were “liberated” from their monasteries, convents, AND their vows. The story goes downhill from there. But what about that? What about Luther’s claim that God made a woman’s “body to be with a man.” Ummm, well, yah, and visa versa. However, and without a long dissertation on celibacy: “With God, all things are possible”. So of course, with God’s grace, a man or woman can give his or her body (and soul) entirely to God. So you might say that Catholics, since we are the only Christians to institutionally place a value on consecrated virginity, are the only true “Full Gospel Church”, i.e. we actually believe that “all things are possible with God”, including consecrated virginity, and take seriously - for those engaged in particular ministries - St. Paul’s Corinthian exhortation to celibacy (1 Cor 7:8-9). 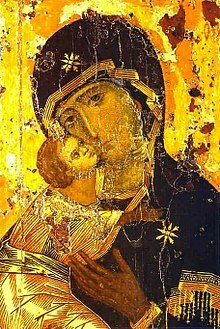 But Luther’s personal peccadillos aside, how do we engage a challenge to our belief in the Perpetual Virginity of Mary? Usually the challenge is based on one of the ten instances in the New Testament wherein “brothers (and/or sisters) of the Lord” are mentioned. A simple response to this is to point out that Aramaic had no word for “cousins”, and “brother” and/or “sister” was used to reference several degrees of kin. Another challenge is based on Matthew 1:25 which says: “And he (Joseph) did not know her until she had brought forth her firstborn son.” The implication is that the word “until” assumes that Joseph and Mary had normal marital relations after Jesus was born. This argument is also easily dispatched by simply referencing other instances in Scripture wherein the word “until” is used, but does not mean that anything different followed: e.g. no one knew the location of Moses’ grave “until this present day” (Deut. 24.6). We still don’t know. And then of course there is the matter of Jesus, on the cross, entrusting his mother to the apostle, John. If Mary had other children, there would have been no need for Jesus to do this. Perhaps the easiest and most useful reply, though, is to simply ask the challenger to show you in the Bible where it says that Mary had other children. He or she will resort to the memorized lines about the “brothers of the Lord”. But stay with the program: continue to ask where it says that Mary had other children. Of course, the Bible never says that she does.